St. Martin's Press, 9781137280091, 304pp. The technological marvel of its age, the Erie Canal grew out of a sudden fit of inspiration. Proponents didn't just dream; they built a 360-mile waterway entirely by hand and largely through wilderness. As excitement crackled down its length, the canal became the scene of the most striking outburst of imagination in American history. Zealots invented new religions and new modes of living. The Erie Canal made New York the financial capital of America and brought the modern world crashing into the frontier. Men and women saw God face to face, gained and lost fortunes, and reveled in a period of intense spiritual creativity. 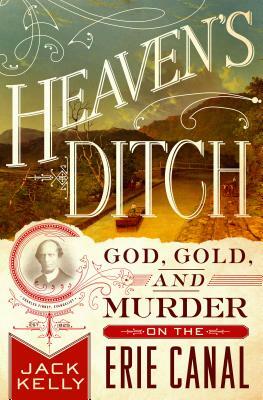 Heaven's Ditch by Jack Kelly illuminates the spiritual and political upheavals along this "psychic highway" from its opening in 1825 through 1844. "Wage slave" Sam Patch became America's first celebrity daredevil. William Miller envisioned the apocalypse. Farm boy Joseph Smith gave birth to Mormonism, a new and distinctly American religion. Along the way, the reader encounters America's very first "crime of the century," a treasure hunt, searing acts of violence, a visionary cross-dresser, and a panoply of fanatics, mystics, and hoaxers. A page-turning narrative, Heaven's Ditch offers an excitingly fresh look at a heady, foundational moment in American history.